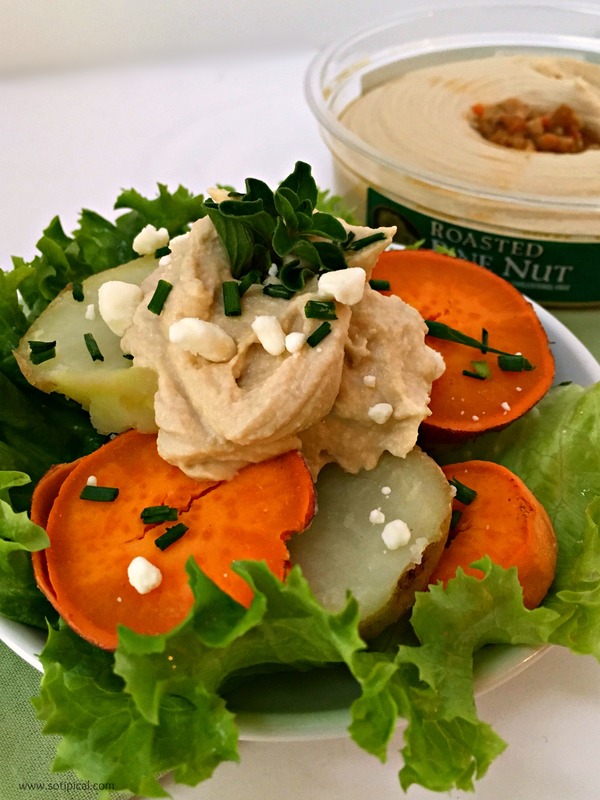 Keep yourself fueled and ready to go with these easy hummus snack ideas. We’re a busy family and always on the go, so I look for easy snacks and mini meal ideas that my whole family can prepare. Hummus is a great snack and can be enjoyed in so many ways. 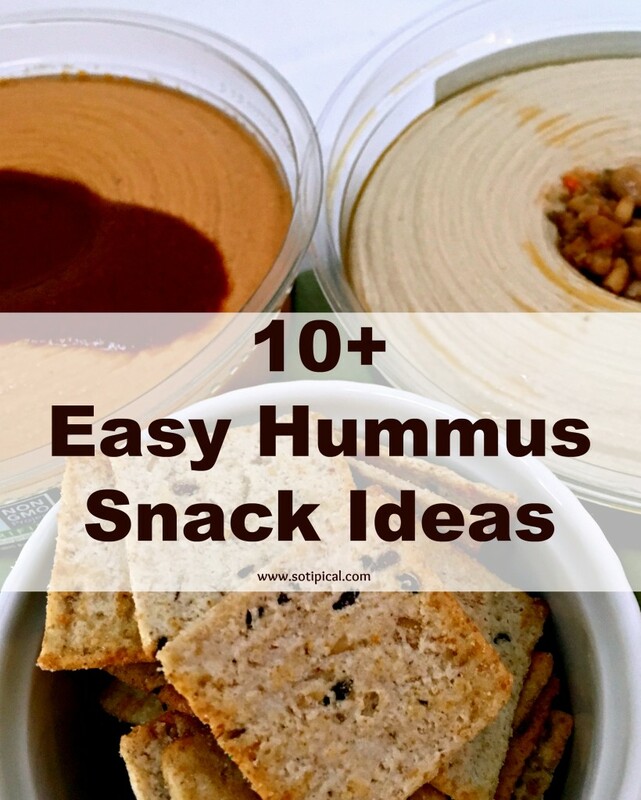 Here I will share many of the ways our family has used hummus for snacks and packed lunches. I recently learned that Boar’s Head has a line hummus in several great flavors, I can’t wait to try them all! I’m even going to suggest ways you can use Boar’s Head Hummus to make some fabulous holiday appetizers too! Hummus & Crackers – Of course this is the easiest of the all. I often pack this for lunch or between activity snacks. This is also one of my husband’s go-to snacks. Any hummus variety works. Hummus & Raw Veggies – My kids rarely bring a “traditional” lunch to school of a sandwich and chips. They often prefer “snacky” type items in their lunch box, which may include hummus with cut up veggies and pretzels. Traditional, Roasted Pine Nut, Roasted Garlic & Roasted Red Pepper varieties would my first choices for this, though they would all work well. Avocado & Hummus Toast – On a slice of toast, spread Traditional or Roasted Garlic Hummus, then top with sliced avocado and a sprinkle of salt & pepper. Deviled Eggs, 3 Ways – 1) mix your desired flavor of hummus with the mashed yolks, then fill the hollows of the eggs. 2) Discard the yolks and use desired hummus flavor in the eggs. 3) Fill eggs with a mixture of mashed avocado and your desired flavor of Boar’s Head Hummus. 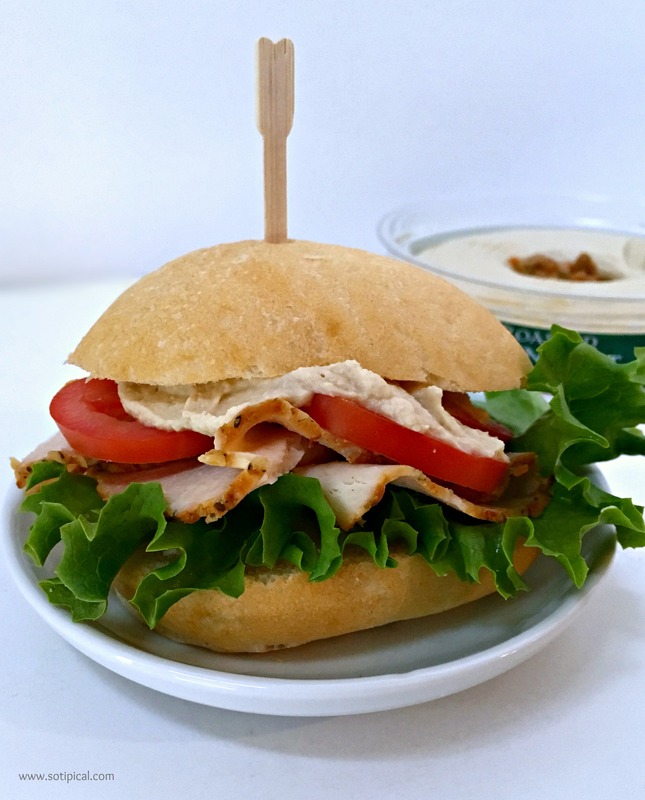 Mini Turkey Sandwich with Hummus – Here I use Boar’s Head Roasted Turkey, lettuce, tomato and Roasted Pine Nut Hummus. Traditional, Roasted Garlic, Fire Roasted Artichoke & Spinach would be my first picks. Again, all would work. 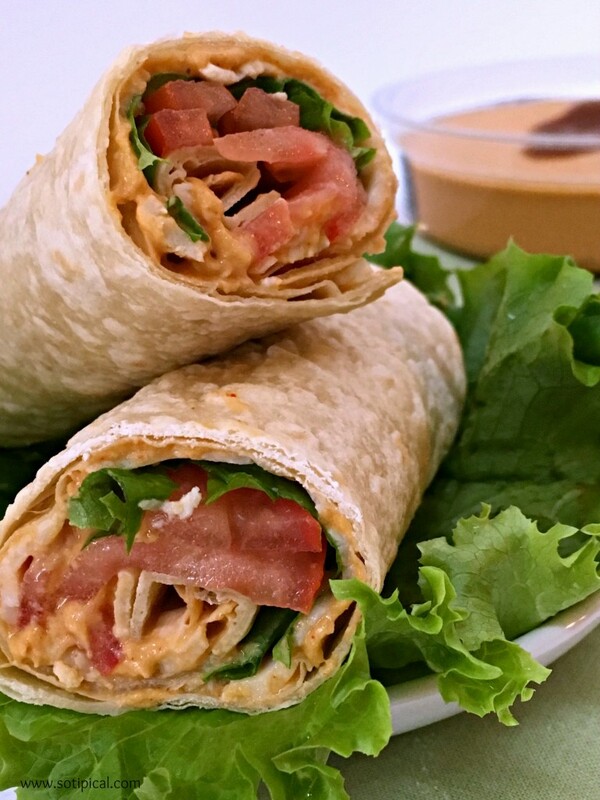 Southwest Chicken Wrap – Spread Fiery Chipotle Pepper Hummus in a tortilla, then layer with a slice or two of Boar’s Head Oven Spicy Roasted Chicken, thinly sliced tomato, cilantro and lettuce, then roll it up. Southwest Style Black Bean Hummus would also be great in this. Crostini Appetizers – Here are 8 ways you can serve a Fast & Fabulous Holiday Appetizer at your next gathering! Spread Tuscan Style White Bean Hummus on toast rounds, topped with parmesan shavings and chives. Spread Roasted Red Pepper Hummus on toast rounds and sprinkle chopped fresh herbs over top. Spread Roasted Garlic Hummus on toast rounds, then top with ribbons of sun dried tomatoes and a drizzle of olive oil. Spread Kalamata Olive Tapenade Hummus on toast round, then top with chives and feta crumbles. Spread Kalamata Olive Tapenade Hummus on toast round, then add a thin slice of chicken and a sprinkle of oregano on top. Spread Traditional Hummus on toast rounds, then add a sprinkle of fresh cilantro and top with a thin jalapeno slice. Spread Fire Roasted Artichoke & Spinach Hummus on toast rounds, then top with chopped fresh parsley. Spread Southwest Style Black Bean Hummus on toast rounds with crumbles of queso fresco over the top. *All of these crostini ideas can be made carb or gluten free by using cucumber slices in place of toast rounds! Cold Potato Salad – While you could prepare a large batch, I had some leftover baked white and sweet potatoes and made a single portion. Sliced potatoes on a bed of lettuce with a dollop Boar’s Head Roasted Pine Nut Hummus, feta crumbles, chives and a touch of fresh oregano. This was very tasty! I would also use Traditional, Roasted Garlic, Fire Roasted Artichoke & Spinach Hummus would also be delicious! Vegetarian Tortilla Wrap – Spread desired flavor of Boar’s Head Hummus in a tortilla and layer lettuce and some very thinly sliced tomatoes, peppers, cucumber, sprouts, etc. Roll it up and enjoy! All varieties of hummus would work in this wrap. Spicy Hummus With Tortilla Chips & Bell Peppers – One of my girls loves to tortilla chips and dips. 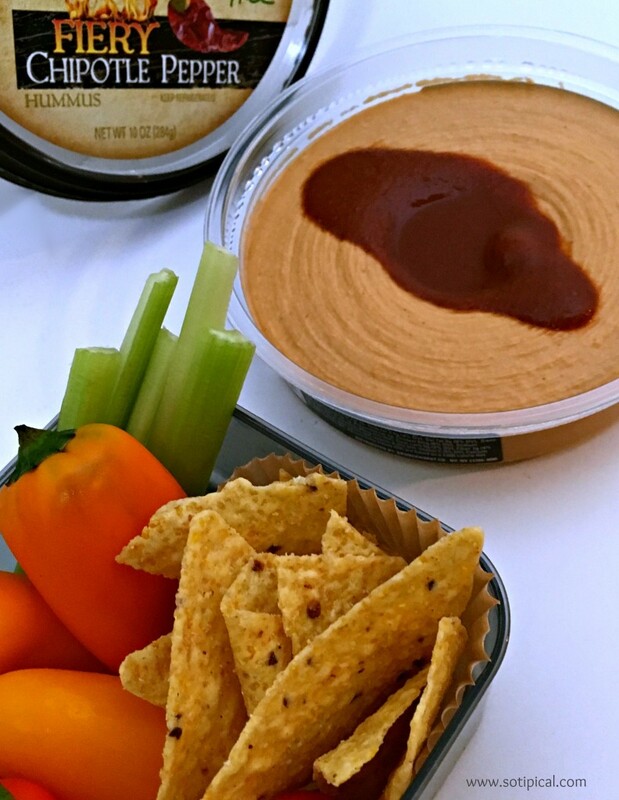 The Boar’s Head Fiery Chipotle Pepper Hummus pairs well with chips, salsa and crunchy bell peppers. The Southwest Style Black Bean Hummus would also pair well. 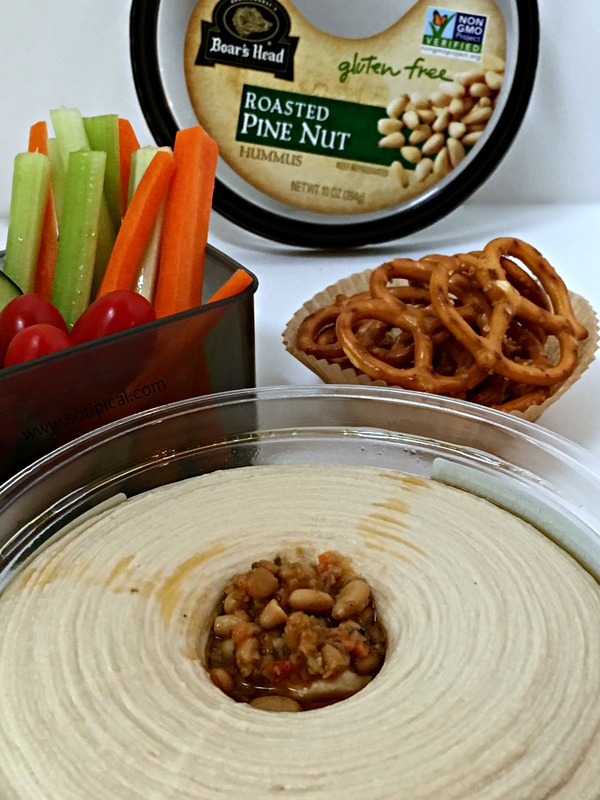 Which of these hummus snack ideas are your favorite? Head over to Boar’s Head to see all of the fabulous flavor choices they offer and let me know which you’d try first!